This declaration expresses the U.S. Catholic community’s call to climate action, arising from our theological foundation, proclaimed to all within our one human family. From this call we envision, pray for, and act towards a thriving future, with our family and the gift of God’s creation. Please encourage the leader of your Catholic institution to sign the declaration. Go to the U.S. Catholic Climate Declaration FAQs page for more information. Download the Step-by-Step Guide to Gathering Signatures for the U.S. Catholic Climate Declaration. Download the U.S. Catholic Climate Declaration Leave Behind sheet to use in meetings with the leader of your Catholic community. Read the letter from Bishop Pates to the Catholic community urging Catholic leaders to sign the declaration. Use our letter template to encourage your bishop or priest to sign the declaration. 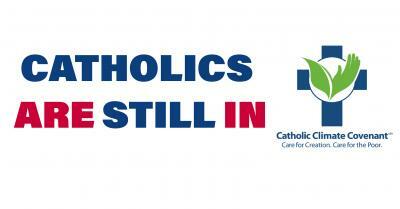 Watch our Catholics Are Still In Campaign webinar to learn how you can promote the declaration in your faith community.